This was the run I’d been training for since the beginning of January. It was why I’ve been running reps up and down Frodsham Hill, and why I’ve been running longer events than usual all year. My first attempt at the end of May was battered into failure by driving rain, and I didn’t really know what to expect this time: the weather had been awful for days, but the forecast was for gradual improvement with showers and cloud. And I really didn’t know whether I was up to the task even if the weather was good. But yesterday it all went right. 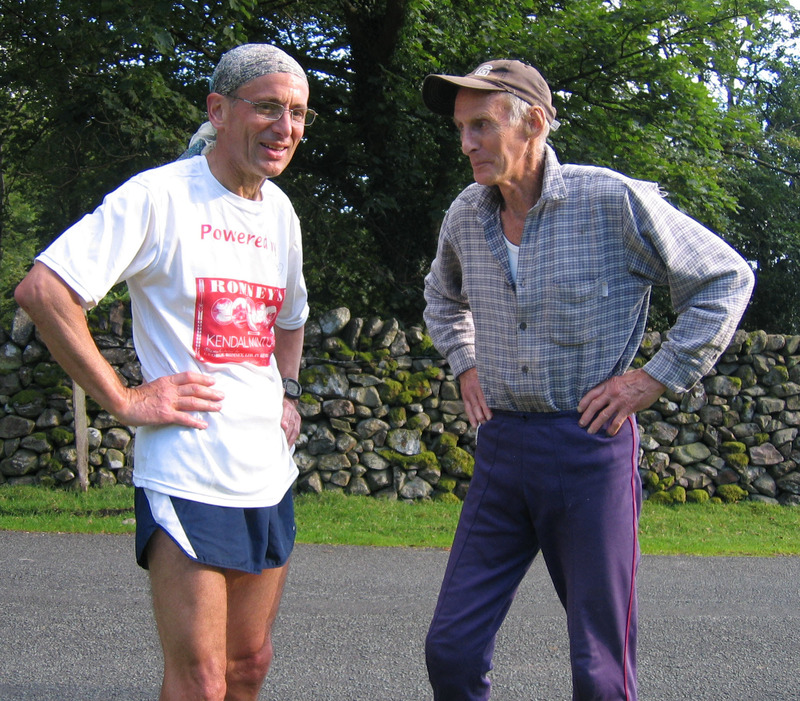 My target was 15 hours, and I got under this by over an hour, finishing at Joss Naylor’s house in Wasdale 13 hours 56 minutes after leaving Pooley Bridge. For those of you who don’t know, the JNLC is a challenge run set by Joss Naylor for the more mature runner. Men over 50 must complete in 12 hours, over 55s have 15 hours, over 60s 18 hours, and over 65s have 24 hours. Women get a bit longer. It’s not the sort of challenge most over 50s would have on their ‘must do’ list, as you would expect from a challenge devised by Joss. It’s the equivalent of about 2/3 of a Bob Graham round, being around 45 miles long, with 17,000 feet of climbing. It crosses the tops of 30 fells, including High Street, Fairfield, Bowfell, Great End, Great Gable and Pillar, finishing with a great runnable descent off Middle Fell to end at Greendale Bridge by Joss Naylor’s farmhouse. To qualify for an invitation to the October dinner to be presented with a tankard your run must be witnessed by pacers, and you must collect at least £100 in sponsorship money for charity. I’ll be coming after you all for the money you promised once I’m back from my family holiday (Wed 17 August I should think). The alarm went off at 4am in the bunkhouse in Glenridding, and Chris and I got ready to go, mainly involving eating and a brew. 15 minutes’ driving and we were parking up at Pooley Bridge, and at 5 on the dot we headed off up the fells to run the ridge south to High Street. It was so different this time – no rain no wind in our faces, and we could actually see the fells. And no sign of the promised showers, in fact I was running in shorts and t-shirt all day. At the end of the ridge we faced the steep pull up Stony Cove Pike, then raced down to Kirkstone Pass arriving 15 minutes up on schedule. There was no sign of the promised reception party (which would have been a brief ‘well done’ and a handshake as we ran past), so we started on the path up Red Screes, shortly hearing a shout from the car park – he’d missed us as we were early. We shouted back, but that’s all – we had to press on, up the steep side of Red Screes. Easier running followed, up to Hart Crag and then Fairfield, the only two tops we crossed in cloud. At about this time Joss Naylor was tending to sheep in Middle Fell and got drenched by a heavy shower, but we didn’t get a drop. Down the scree path then steeply up Seat Sandal and a good run down and we were at Dunmail Raise, meeting up with Julian, Bryan, and Bryan’s dog Holly. I was 25 minutes up on schedule by this time, but starting to feel pretty tired. No stopping, and Bryan led up the hardest climb of all, desperately steep up Steel Fell. Our routefinding wasn’t perfect from here to High Raise, but we only lost a few minutes, then down to Stake Pass, Rossett Pike and the Bob Graham route up Bowfell. I was feeling pretty rough on this section, and Bryan had to coax me along. I recovered well on the easy section to Esk Pike and Great End, and we scampered down the steep descent to Sty Head, arriving 30 minutes up. Peter was waiting for us there. Again no stopping, and it was straight up the tourist route to Great Gable, a steep unrelenting climb, but I was feeling quite good and kept up a good pace, hands on my knees at times. This was familiar ground, and at last I started to believe I was going to finish. It had been hard work hanging on to that for a while. At Beck Head we were unexpectedly met by Chris and Julian, who had walked up from Wasdale, and Julian joined us for the rest of the way. Kirk Fell was OK, and on the top we caught up Peter’s wife Sheila and Alan, who were out recce-ing the route themselves, bring the party up to 6. The long pull up Pillar wasn’t too bad, as I’d done it not long before and knew what to expect. Easy ground followed to Scoat Fell and Steeple, and the run down towards Haycock is always good. I started feeling the strain again on the steep pull up Haycock though, and didn’t speak much from then on. I could hardly eat and even sips of water were hard to swallow. The descent from Haycock is on grass so that wasn’t too bad, then we crossed the boggy depression to the foot of Seatallan, getting our feet wet for the first time. I doubt anyone’s ever got across there in running shoes without getting wet feet. The steep climb up Seatallan I was dreading after my experience recceing, but I plodded up, and it wasn’t so bad. I suppose it was because I was so close to the end and half in dreamland. At the top someone said “if you can keep going you might get under 14 hours”, so we belted down the side of Seatallan, up Middle Fell and down to Greendale Bridge, beating 14 hours by just 4 minutes. My pacers were great: I’d have really struggled to finish without them. As it was, we finished in style, racing down the hillside. I lay down on the grass and closed my eyes, so grateful at being able to stop at last. Then “the big man’s coming”, so I got up, to be welcomed by Joss Naylor. Chris took a couple of photos, and we chatted to a while, then Joss went off to bring me back a pint mug of tea – no tea ever went down better. Half an hour more standing around talking, then we headed off home to collapse. This was the hardest run I’ve ever done, and a tremendous outing. I won’t forget it for a long time.